The average strength of the garrison was 100 officers and 2,604 men, excluding the 468 men of the Royal Malta Fencible Regiment. Strength of the Garrison. † stands for deaths (TNA:WO 334/10). The garrison had the minimum number of troops required to guard the Dockyard and the extensive fortifications. Any decrease in British troops was made up for by an increase in the Maltese Fencibles. The Maltese not only made good soldiers, but were cheaper to maintain than a British battalion. There were 39 deaths among the men in hospitals, 5 among the women and 27 among the children. There were an additional five deaths outside the regimental hospitals mainly: two suicides in the Royal Fusiliers in barracks; two sudden deaths in the Royal Highlanders, one from a ruptured aneurysm, the other from apoplexy; and one in the 94th from periglottitis, while on detachment at Gozo, under the care of the assistant surgeon of the Royal Malta Fencibles. Assistant Inspector of Hospitals John Davy described the peculiar weather of 1833. The first quarter ending on 31 March, was cold and rainy to an uncommon degree. The second quarter ending 30 June, was also very rainy, with showers common even in June, when the temperature did not rise above 24 C. In the third quarter ending 30 September, the weather was unusually variable, with heavy rains in September. The fourth quarter ending the year was tempestuous, cold, and rainy. Consequently, there was an increase in pulmonary complaints and more sickness and deaths among the troops, than in the previous year. There were 55 admissions for pneumonia and 3 for pleuritis. The greater mortality among the troops was attributed entirely to an unusual prevalence of pulmonary disease, accounting to more than one half of the whole number of deaths instead of about one-eighth of the average proportion, and more than a third by Phthisis Pulmonalis instead of about 1:32. 6 Jan: Able Seaman Alexander Campbell, 32 years, HMS Raleigh. 18 Mar: Ordinary Charles Friber, HMS Alfred. 22 Mar: George Rose, HMS Scylla. 18 Apr: Carpenter J Wickland, HMS Ceylon. 24 Apr: Vice Admiral Sir Henry Hotham Flagship HMS Barham. 13 May: Master Baker John Allens 59 years, Commissariat Department. 17 May: Midshipman Thomas Huskisson HMS Cordelia. 5 June: Jane Hobkirk, 80 years. 6 June: Able Seaman John Rae, HMCutter Hind. 15 June: Ordinary James Lintot 21 years, HMS St Vincent. 25 Aug: Seaman John Campbell HMS St Vincent. 15 Sept: Able Seaman Richard Palmer 21 years, HMS Alfred. 3 Nov: Pte Marine Thomas Hanscomble HMS Actaeon. 1 Dec: Pte Marine William Sheppard HMS Scylla. Sir Henry Hotham's memorial in Upper Barracca Gardens Valletta. On 19 April 1833, Vice Admiral the Hon Sir Henry Hotham KCB GC St Michael and George, Commander in Chief of the Mediterranean Station died suddenly, aged 57 years. He was buried at Msida Bastion Cemetery. 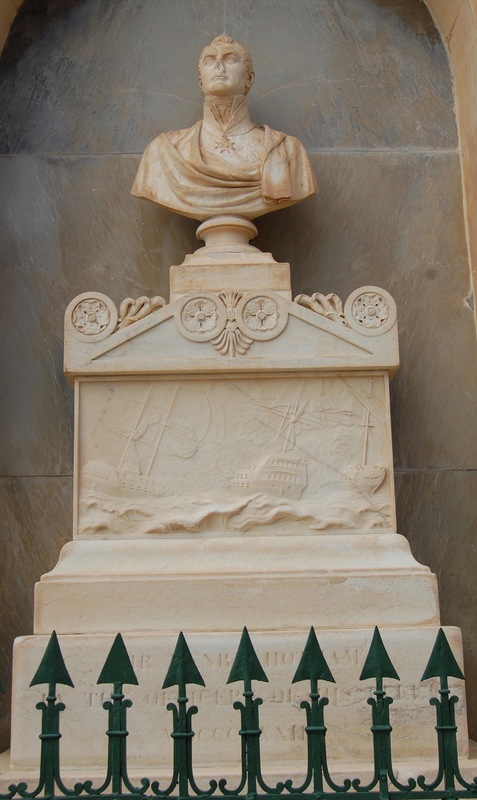 A memorial bust was erected at the Upper Barracca Gardens Valletta. The fatal cases of remittent fever were due to a brain abscess and to inflammation and ulceration of various organs in the 7th, to pneumonia in the 42nd, and to peritonitis in the 94th. Three cases of intermittent fever were relapses in the Fusiliers who had had similar fever before their arrival in Malta. There were 19 cases of Common Continued Fever among the women, 1 proving fatal. The PMO was of the opinion that the recurrence of both intermittent and remittent fever showed the presence of malaria in Malta. In 1832 and 1833, both fevers were observed to be more common than usual in Malta. A list of all the Officers of the Army and Royal Marines. War Office 10 January 1833. TNA:WO 25/3901, Records of Service - Officers of the Medical Department (1790 – 1847). TNA:WO 17/2139, Returns of the General and Staff Officers of the hospitals attached to the forces in Malta (25 January – December 1833). TNA:CO 158/75, Malta Original Correspondence to the Secretary of State (January 1833– May 1833). TNA:WO 334/10, Sick Returns and Reports of the Garrison of Malta from 1 January 1833 to 31 January 1834.